Driving the serpentine US-19 from Cherokee to Maggie Valley across Soco Gap requires a driver’s undivided attention, which explains why so many never notice the small sign that says “waterfall .5 mile” (which means ‘keep driving another half-mile’). UPDATE: New, more informative signs have been installed. It’s also easy to miss the gravel roadside pull-off with space for maybe a half-dozen vehicles. But that’s where you’ll find Soco Falls, a beautiful double waterfall where two separate branches meet for spectacular 40 and 50 foot drops into a dark gorge. The short trail starts at the break in the guardrail and descends about a hundred feet over some steps to the viewing platform. Some people scramble down the bank to the base of the falls, but it’s extremely steep and not recommended. Soco Falls is on the Qualla Boundary about eleven miles east of Cherokee, on your right. Coming from Maggie Valley, the pull-off is 1.5 miles west of the Blue Ridge Parkway, on your left. 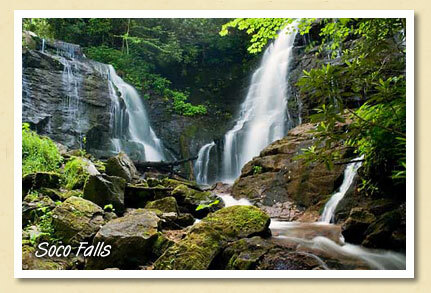 The photo is by Rich Stevenson, an Asheville photographer with a passion for Western North Carolina waterfalls. If you love waterfalls, Rich’s website NCWaterfalls.com is a must-see.